So you get the latest Yngwie Malmsteen album for your collection or, in my case, also for review. What's the first thing that you do? Play air guitar? Pick your favorite solo? Wonder why hardly any young American rock or metal band can't furnish a single guitarist or a solo near this caliber? (Sorry, that was pure cynicism.) Or try to figure out what foam mousse he's using in his hair these days? (Just kidding on that one, pure sarcasm). I'm probably inclined to the second option of picking my favorite solo(s). However, on 'Perpetual Flame,' as good as the solos may be, there much more going on here. 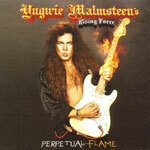 Malmsteen's 'Perpetual Flame' will please longtime fans and, hopefully, capture the interest of and inspire a new generation of aspiring guitarists. This easily one of his best works in many years.